Yep, you got it. 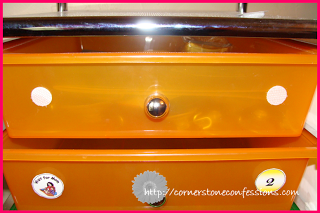 This super planning teacher minded mom is getting ready to start homeschooling her preschool daughter using workboxes. I was actually pretty excited about this purchase. 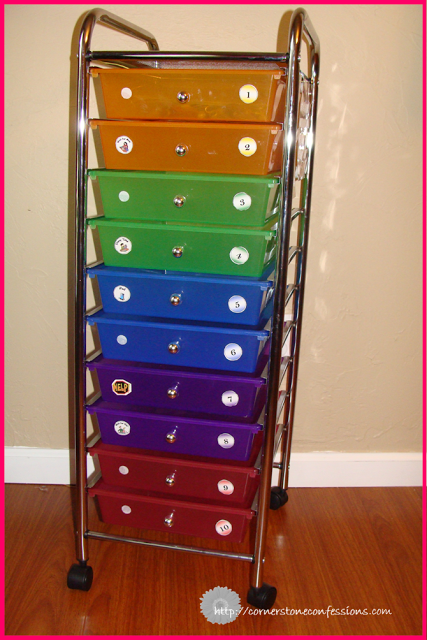 I ordered this 10 drawer storage cart online from Joann’s Fabric (we don’t have a Joann’s near us). Normally these carts cost around $80, but when I purchased it, it just happened to be on sale for 60% off. I then went through ebates to get another 10% off because it was double rewards at the time and even qualified for free shipping. The final cost…$26! Woot! Woot! But, I digress. For those of you unfamiliar with the workbox system, it is a organizational system for the homeschooler originally designed by Sue Patrick. I first heard about it from Erica over at Confessions of a Homeschooler. 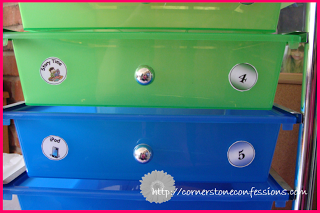 Being one who runs best on organization, I knew that if I was going to teach my kids at home I needed some manner to organize our day. Thus, the workbox system. One activity or subject is placed into each of the workboxes every day. Peanut will know exactly how much she is to accomplish in one day by how many workboxes she has left to complete. As she completes a box, she will take the task label off the workbox and place it on her Workbox Success Chart. When her Workbox Success Chart is full, she’s done. And, this mom will know she’s done preparing for the next school day when she’s filled those 10 workboxes. Since its creation, the workbox system has grown into many shapes and forms. Just do a google search for “homeschool workboxes” and you’ll see what I mean. Many people have vamped it to work best for their family. There’s even a Workbox Blogroll with nearly 200 workbox bloggers and several yahoo workbox groups if you decide to really get into it. 1. 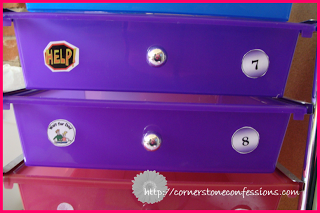 I placed 5/8 inch round velcro stickers on either side of the drawer. The dots on the right are for the number labels or subject labels. The dots on the left are for “help me” labels or item labels that Peanut will redeem for an object such as iPod or TV time. Drawer five has an iPod label. In order to complete the task in drawer 5, Peanut would hand me the iPod label for me to set up the iPod game for her to complete. 2. Next I created a Workbox Success Chart and a Spare Me card to place all the extra labels. The Spare Me card provides a place to store all the extra labels not in use and gives Peanut easy access to her “Help!” labels. 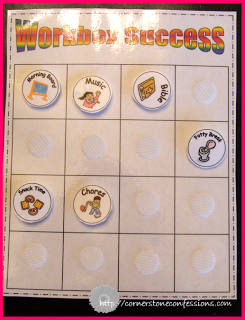 The Workbox Success chart complete with 16 velcro spots. 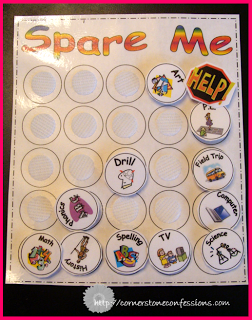 This allows for 6 other activity labels such as morning board, potty break, chores, or snack time. 3. 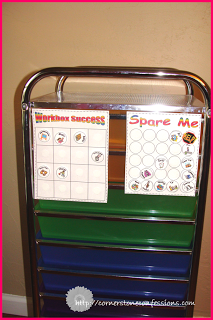 I then added some extra velcro dots to the side of the cart to place the Workbox Success Chart and Spare Me Chart. The nice thing about this is that now we can take the charts off and place them by her work area if we don’t want to leave them on the cart all the time. 4. This leaves us with our finished workbox station. I can’t wait until we start using it! In all the excitement of planning, I kind of went overboard with workbox labels. I’m providing a copy of our workbox labels below. Some people prefer using the number system for their workboxes while others use subject labels. Thus, I tried to include both to appease both sides of the fence. I also tried to include as many subjects as I could think of as well as a variety of names for each subject. For instance, did you know that what may be typing to one family is computers to another, keyboard in another, or even technology in still another? Needless to say, I could have made labels for days but hopefully these 70+ labels will give you a good start if you are interested in developing your own workbox system. I’m also including my Workbox Success chart and Spare Me chart as well. Just click on the image below to download and let me know how you like your new system! 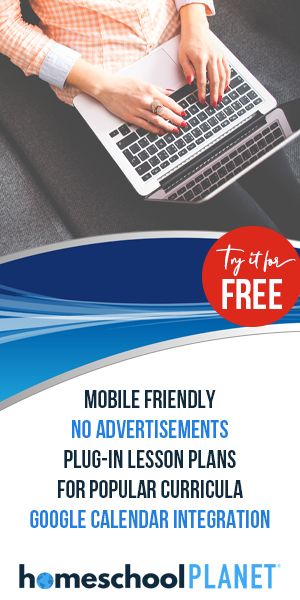 Click to Download Your FREE Workbox System Labels Now! By the way, I’m currently creating a preschool workbox curriculum which I hope to be sharing with you very soon as Peanut starts school. I’m so excited about it because it not only includes those regular workbox items and activities but also ideas for music, PE, morning board, memory work, and more all related to the topic, letter or number of the week. I’ve seen several amazing homeschool curriculums out there but none that are all-inclusive so be sure to come back and check it out in July as you get ready for your new school year. Do you use a workbox system already? If so, please leave a link or your story below. I’d love to check it out! I use a shelving unit with bins inside for Gavin, but I don’t use the success chart for him. I think I am going to find a way to incorporate that! I can’t wait to see your curriculum. Wow! I wish we had these when we tried home schooling. very nice system, and I love that you got such a good deal on the cart! Love the success chart! I think this would be a great help to my preschooler. thanks for the download! 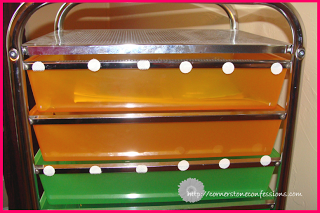 Where do you laminate your supplies? I actually laminate my own with a Scotch Laminator. That said, there have been a few times I go to Mardel’s too. They only charge 25 cents per foot which is a great deal too. The Scotch laminator just makes laminating so convenient though. I now realize why other home schoolers say it’s the must have item. I totally agree. Hope that helps. JUST WONDERING IF YOU STILL LIKE THE SET-UP(SHELVES) AS I AM LOOKING TO GET THE SAME SHELF SYSTEM BUT IT HAS BAD REVIEWS. Some people say they don’t like the shelves because they come out easy. They do. But this is great when you want to take them out for an activity and keep all the supplies together. Some people say they don’t like the shelves because they don’t always stay on the track. That’s true too, but I found that if they are not pulled out all the way, they are not as much of a problem. All that to say, for the price (75% off at a craft store) and for what we use it for, do we still like the set up? Yes. Definitely. If you want to try the workbox system with something more sturdy so that the drawers don’t come all the way out and where the drawers don’t come off the track, you might buy a couple of those large stackable Rubbermaid drawers. I have seen several homeschool families who have used those and liked those better for their homeschools. So there you go. I’ll be interested in seeing what you decide but either way, I definitely encourage workboxes. It makes our day so much easier. Happy shopping! Hi i just downloaded your work box system, which i love the look of but i was just wondering if there is anyway i could get some blank one emailed to me as i have designed my own curriculum for my son and need space for numbers, colours, shapes, swimming etc.